We were standing behind the open-air stage, waiting to go on to dance, when we heard wonderful fiddle music of a type we had never previously come across. Mike and I each ran round to the front to see whatever was happening on the stage, and we saw fiddle-players, guitarists and a bass playing while the strangest, most elegant group of dancers we could imagine, danced onto the stage to perform, but dancing as real people from a real place, not like a choreographed group such as the Russian Cossack dancers. We watched as long as we could before we had to dash back to perform ourselves. From that moment we were enchanted. 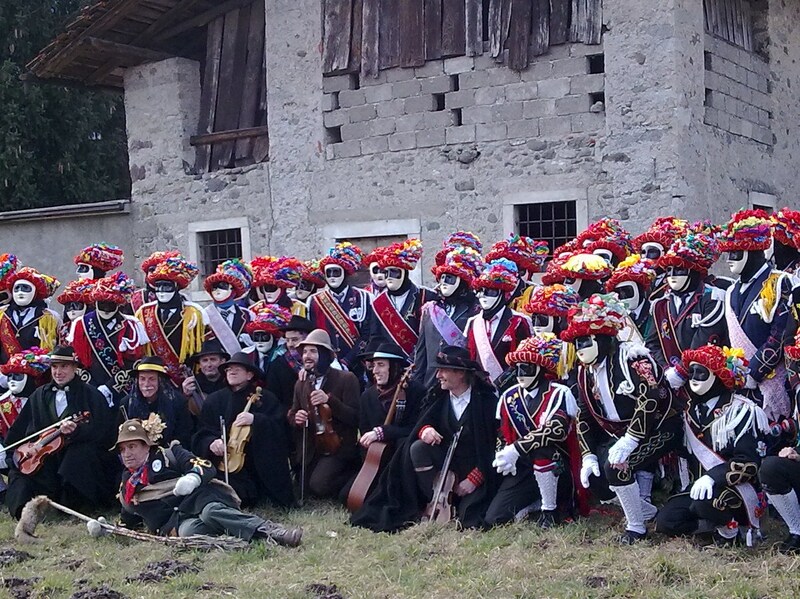 We had been watching the Company of Carnival Dancers and Players from Ponte Caffaro, Italy. It was 1985, and our morris teams, Martha Rhoden’s Tuppenny Dish and The Shropshire Bedlams, were dancing at the International Dance Festival, Sidmouth, Devon. It was the third time we had been invited, and we had looked forward to it, as always. We had a wonderful week, despite the terrible rainy weather, and having to dance sometimes in stuffy small marquees when it was too wet to dance on the Arena stage, which in those days was not covered. 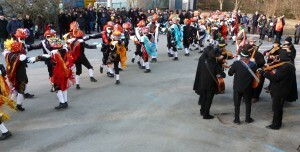 During that week, we frequently danced at the same venues as the Carnival Dancers and Players. I watched them as often as I could, and, when possible, I talked to Bernardo, one of the violinists who could speak English, about their dancing, as well as sitting with wives and girlfriends, also dressed traditionally, on the grass at the Arena while the men were dancing, not able to speak with them exactly, but trying to communicate that I really loved what the dancers and musicians did. To return to the Compagnia dei Ballerini and Suonatori di Ponte Caffaro. The musicians were dressed in traditional north Italian Alpine costumes, made of dark moleskin type material. 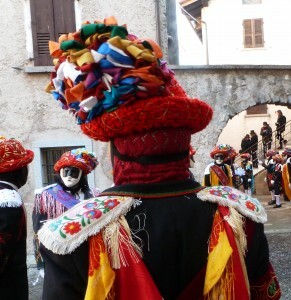 In contrast, the costumes of the dancers had little to do with the north Italian countryside. They were quite stunning – colourfully embroidered, flowing and shimmering with the movements of the dances. The hats were particularly fine, covered with the family jewellery and intricately covered with over one hundred metres of ribbon. 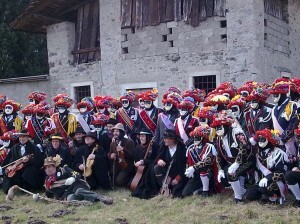 And they wore masks covering the whole face while dancing; creamy white masks, made up with lipstick and rouge colours, and black painted around the eyes like a highwayman’s mask. In fact, their costume enclosed them completely, even down to the balaclavas and scarves round their necks and their white, hand-knitted stockings and gloves. It gave them a slightly non-human quality while they were dancing. The hats are truly magnificent, although in this image, the gold jewellery cannot be seen. By the time we went home at the end of the week, we had a dream. One day, we said, we would go to Ponte Caffaro to watch the Ponte Caffaro Carnival Dancers dance in Ponte Caffaro. Then our dream would be fulfilled. We promptly forgot about our dream, as real life took over again. Between family and work commitments, we didn’t really think much about such things for eight years or so, other than occasionally learning to play one of their tunes from the tape we had bought from them while in Sidmouth and saying how wonderful they were. I was teaching, and in 1993, we had gone in the February half term to Naples for a week. We thought we would go to Crete the following February, but when we came to book, we found there were no direct flights to Crete from England, and we didn’t want to have to change flights while travelling, making the journey longer. What to do? I was idly looking at the travel pages of the Sunday paper, when I noticed that the Venice Carnival was on during the half-term week. 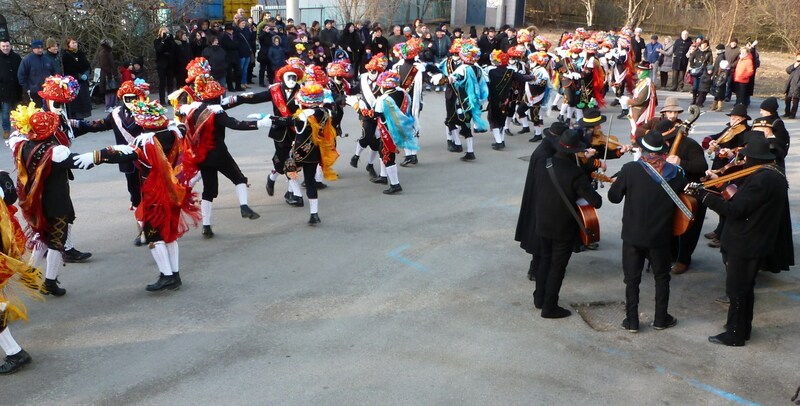 If there was Carnival in Venice, then there would be Carnival also in Ponte Caffaro. Why not go there? Why not fulfil our dream? Could we really go there in February 1994? Could it be done? We then telephoned London friends, who had previously been to Ponte Caffaro and had, indeed, been instrumental in their coming to Sidmouth, so that we could find out about the place. They told us a little about the town and how it was up in the mountains and that it would be very cold in February, and, most important of all, they gave us the phone number of a hotel there so we could book a room for the duration of the Carnival. Our next step was to ask Christina, the post mistress of our village, for advice, as her mother was Italian, and we wondered if she might ring the hotel for us to book a room. It turned out that Rosa, her mother, was from Salò, less than thirty miles from Ponte Caffaro. Not only did she book us a room in the hotel, but she found out about buses from Milan to Ponte Caffaro and wrote a note for us to give to the taxi driver at Linate, Milan airport, so that he would take us on time to the bus for Ponte Caffaro. Wonderful. All was organised. We were so excited to be going. Actually going to Ponte Caffaro! We set off from home in the early hours to catch the plane, and all went well on the journey, notwithstanding the plane being nearly two hours late. The taxi driver looked shocked when he saw the note and the time of the bus, but he put his skates on and shot off, so that we arrived at the bus stop with two minutes to spare before the Ponte Caffaro bus left. By the time we got to the valley climbing upwards from Brescia, the bus was very crowded, full of skis and other equipment as well as people, and as we had got off at Brescia for a short time, our seats had been taken so that we had to stand to start with. The bus reminded us of the Valley Buses at home in the seventies. Full. Good-natured. Going up all the time. We were very hungry and tired on the bus, as we had eaten nothing since breakfast on the plane, and the afternoon was wearing on. I found a sweet or two and an apple, and there was a little bit of breakfast from the plane that I hadn’t wanted at the time, so we were very grateful to eat these little bits and pieces as we sat on the crowded bus. We hoped we would know when we arrived. But then we could see the Lake Idro on our right and knew that the next town at the end of the lake would be Ponte Caffaro. It really did seem unbelievable to us. We could see lights of a village high up on a mountain above the lake, seeming to float in the sky. There was no snow, even though we had been told how cold it would be. But it didn’t really matter. We were arriving at the town at the head of the lake. We had arrived at Ponte Caffaro. We got off with our bags, feeling like two orphans cast out in the night. Tired and hungry from the journey. No Italian. No comforting note from Christina’s mum. A strange town. We walked down the main street with our bags. It seemed like a long way before we were in the main part with shops, and then, as we continued walking, with relief we saw Locanda Antica across the road. We had arrived. Our London friends also arrived very late that night. After hearing we were going, they thought they would like to as well, even though they had a three month old baby who accompanied them. A pleasant surprise for us, they were also booked in at the hotel along with some other folk-loving friends. We had a lovely few days there. We had brought a photograph of us each dancing, so that those who had been in Sidmouth would know who we were. They were very kind and friendly to us all. They even invited us to dance with them in the bar in the evening when the women and children danced to the music. We followed the dancers about. The children danced on Sunday accompanied by the Musicians, and then the Company of Dancers danced all day Monday and Tuesday. We followed them most, but not all, of the time. 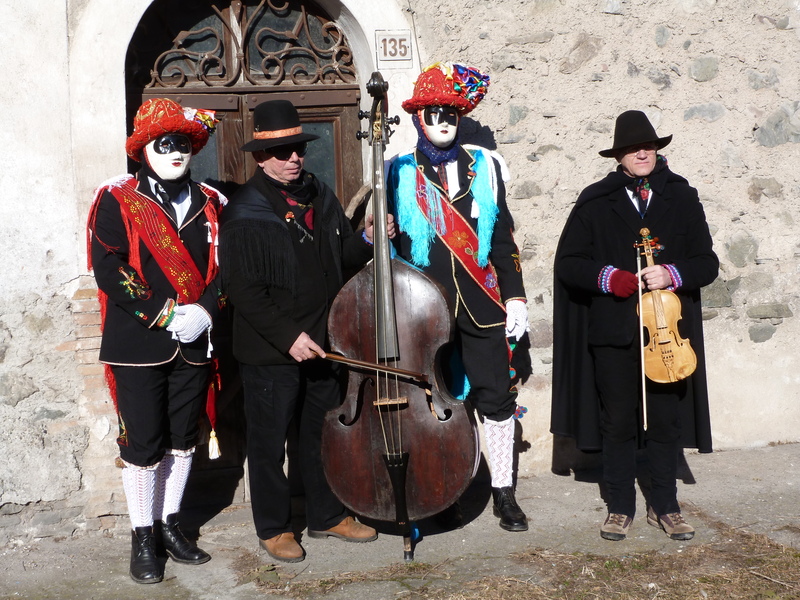 Our London friends took us up to the medieval mountain town of Bagolino to see the dancing there for a while on Monday. In the evenings, the musicians ate together at different restaurants, and played afterwards. We went to listen – and dance when invited – after dinner, and the music sounded as fresh and fabulous as ever. Ponte Caffaro itself was very interesting to us. We felt at home there straightaway, even though we had no Italian and a phrase book was our only method of communication. We live in the Shropshire hills, and Ponte Caffaro seemed to us to be very similar to Bishop’s Castle, our nearby town. The size was similar, the interests of the people seemed similar, they were both towns in a rural setting, and even the look of the people seemed the same to us. We spent a lot of time walking about the town and the local countryside, an area of smallholdings between the town and the River Caffaro down to Lago d’Idro. We stood on the bridge of the Caffaro quite often, listening to the water rushing over the stones on its journey from the mountains above to the lake a mile or so away from it, marvelling that we were there. 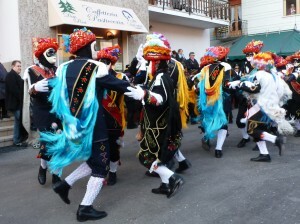 The dancing is carried out all around the town, outside houses, shops and bars. Here they are dancing outside Due Pini, a wonderful place for breakfast on a cold morning. 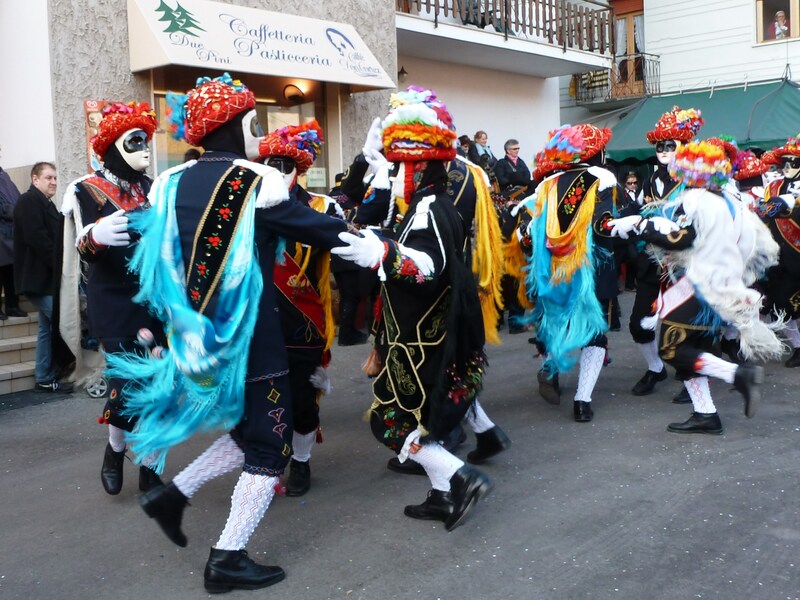 Shrove Tuesday is always the climax of Carnival, and at the end of the day the dancers danced Ariosa, their final dance outside the bar that is now Maggiolino in the growing darkness. We agreed that our dream had been fulfilled, and that we had now been to Ponte Caffaro and could get on with the rest of our lives. We wouldn’t come again. That evening, the musicians ate at Locanda Antica, our hotel, and when we came into the restaurant to eat, Bernardo, the English speaking musician, invited us to dine with them. We were only too happy to do so. It would be a wonderful end to our visit to Ponte Caffaro. Bernardo also gave us a CD of his music, and when we offered to pay, he replied that he did not want payment, as “you are dancers, not tourists”. We were very touched. And very happy to be thought of in that way. After dinner, there was a little music, and some of the dancers came in past the restaurant. A young man came and sat beside us, looked at the photograph of Mike dancing and said: “Seed mout”. We agreed and nodded and said “Si” and “Sidmouth” lots, but we could say no more. He had no English and we had no Italian. The three of us sat together, nodding and smiling and saying “Sidmouth” and “si”. But nothing else. We realised that we wanted to talk to this young man, in fact, these people, find out about them, and communicate properly. We had to learn Italian and return. In September 1994, we enrolled in Italian evening classes in Shrewsbury. In 1996, we returned to Ponte Caffaro, and spoke in Italian – elementary Italian, but Italian nevertheless. We had made a link between the elementary school at Ponte Caffaro and Hope Primary School where I taught, so we visited the school, thanks to Luisella, one of the teachers. Raffaella, who worked at the Co-operative Bank, having found out about the school link, gave us a book about the area, sponsored by the bank. We found Tofen, the young man who had looked at the photograph of Sidmouth, and he and Mike have been friends ever since. We became friends with Gabriella, which has lasted to this day, and her daughter, Giorgia, is like a granddaughter to us. 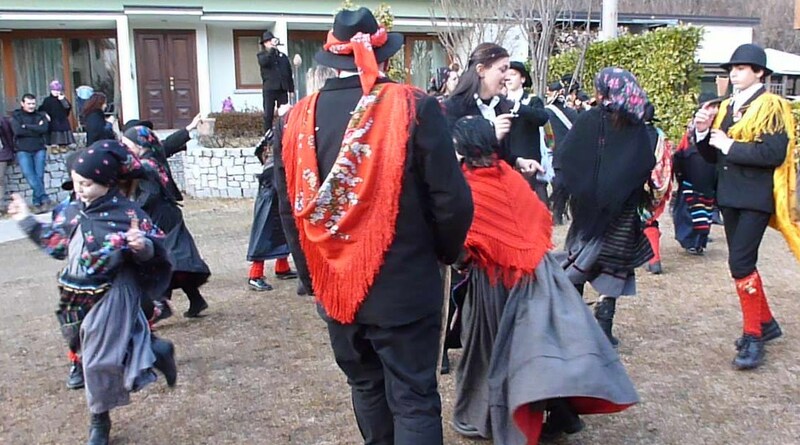 In fact, we made friends with many people, and gradually stronger and stronger links were forged, especially between our two dancing communities. People came to stay with us, and an annual visit to Ponte Caffaro at Carnival was now obligatory as far as we were concerned, as well as other visits at other times of year. Our morris teams were also made welcome to the town, when the company of dancers and players put on a party for them when they were dancing in the area. Since 1994, there has been much coming and going between Ponte Caffaro and Shropshire. A different opportunity for us in Ponte Caffaro arose after the death of my father. He had left me a sum of money which meant that with a small mortgage, we could buy a flat in Ponte Caffaro. This happened, and we, and some of our friends, were able to come out to visit more frequently. Now that we are retired, for the first time, we are having an extended stay, and plan to spend the whole of this winter here.